Amplifier/Speaker Impedance Mismatch? No problem! Setting up an audio system to perform in the best manner possible often takes great investments of time, effort, and money. This process is clearly more art than science. There are many variables to consider, variables that may adversely affect the synergy and ultimate sound quality of a system. Components that work superbly in one system, may fail miserably in another. It has long been known that improper impedance matching between components may result in degradation of sound quality. A considerable amount of time and editorial space has been dedicated to the importance of component impedance matching, particularly for moving coil phono cartridges. Most high quality phono preamps have adjustable input impedance allowing proper matching with moving coil cartridges. Impedance between components is sometimes adjustable as well, providing superior synergistic benefits. Impedance matching between amplifiers and speakers is no less important, especially since the ability of an amplifier to control driver movement, the damping factor, is directly related to the ratio of amplifier output impedance and speaker impedance. In addition, when considering low impedance loudspeakers, some manufacturers specifically state that their amplifiers should not be used with planar speakers like Magnepans because the speaker impedance may dip below a level considered safe for the amplifier. Output transformerless (OTL) valve amplifiers (as well as many other types of amps) work best with nominal impedance loads ranging from 8 to 16 ohms. Paul Speltz, a devotee of OTL amps, decided that he wanted to use his favorite DIY speakers with his OTL amp, but the nominal speaker impedance of 4 ohms wasn't a good match for his amp. After working with other fans of OTL amps who had similar problems, Paul realized what was needed was a device that would cause the amp to 'see' the impedance load from the speaker as being an ideal load. With these thoughts in mind, Paul designed the ZERO Autoformer, a simple transformer with only one winding but multiple taps. The result? The Autoformers multiply impedance and allow a user to select a tap that will multiply the speaker impedance load for the amplifier. Suddenly, a 4-ohm speaker can be seen as a much higher impedance, even up to 16 ohms. Impedance matching for speakers and amps can now be done with almost any combination of models chosen. The ZERO Autoformer is a simple, single-winding, toroid-core, transformer. The ZERO has a reported frequency response of 2Hz to 2MHz, so they shouldn't interfere with the extreme ends of the audible spectrum. Paul Speltz's original ZERO Autoformers were DIY units that consisted only of the impedance transformer with multiple taps. It was up to the end user to decide how best to use them. Paul has since designed and provides three models: the DIY-ZERO model, at the bottom of the price scale, the ZERO-Box, at the top of the price scale, and the ZERO-Cables in between. 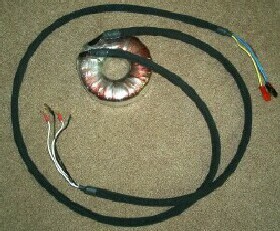 One ZERO-Cable with 2.4m (8 ft.) speaker leads. The ZERO-Cables consist of the Autoformers with all leads meticulously combined into insulated speaker cables with attached spade ends. There are four amplifier leads, two positive and two negative. By combining one of each, four different combinations result in 2x, 3x, and 4x multiplication. The speaker ends also have four leads, two positive and two negative. There are no impedance multiplication changes from the four leads on the speaker end of the unit - the four leads are designed to be used for bi-wiring. 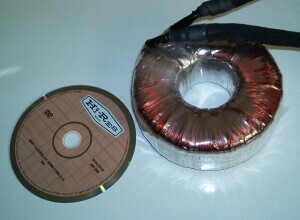 The transformer itself is a toroidal unit approximately 12.7 cm (5 in.) in diameter and 5 cm (2 in.) thick, covered with clear plastic wrap. Product identification and usage instructions are included on the label. The ZEROs were designed to correct impedance mismatch problems between OTL amps and most available speakers. However, OTL owners comprise only a small portion of audio enthusiasts. Is there a benefit to the Autoformers beyond OTL applications? The short answer is: yes. However, it is not as simple as that because of cost/benefit ratios. Over the past several months I have used the ZEROs with five different amplifiers and eight pairs of loudspeakers. The amplifiers included solid state (recent and vintage), and valve amps including examples of single-ended triode and pseudo-triode, ultralinear push-pull, and single-ended pentode. The speakers had nominal impedance ranging from 4 to 8 ohms and used different designs including single-driver, two-way, and three-way, bass reflex, transmission line, and rear-loaded horn. ZERO-Cable connected at 2x to Fi X speaker binding postsb . While working with the ZEROs, my experience confirmed what Paul states on his website, that too low impedance results in poor woofer control and soggy bass, and too high impedance has little bass at all and results in an overly bright, tinny presentation. With most speaker/amplifier combinations I tried, increasing the impedance brought sonic benefits that included more than just better bass control. In most cases, fine detail and liveliness of the sound made music more compelling. There were a few exceptions. The greater the impedance mismatch, the better the Autoformers work. For example, when using the Decware SE34-I (a parallel, SET amplifier, 7 wpc) to drive a pair of 4-ohm, Reynaud Twins with speaker cables, bass was reasonably deep but soft, poorly controlled, and mid-range sounded flat and lifeless. In short, this was a terrible combination. However, when using the Autoformers in place of speaker cables and multiplying the impedance, the combination worked very well. After playing with all three Autoformer leads, the best for this combination seemed to be 3x, which resulted in a nominal impedance of about 12 ohms. At this impedance, bass was clean and bass transients were sharply defined and very well controlled. Middle-frequencies delivered the lively, natural tones and presence for which the Reynauds are famous. Most importantly, with this combination, the Reynauds delivered the beautiful, musically captivating performance that I most appreciate about them. More definitive results were obtained with a nOrh SE9, a single-ended pentode amp (9 wpc). In fact, the SE9 sounded its best with impedance of about 16 ohms, regardless of which speaker was used. During the review of the SE9, I noted that bass control was decent, but not great, resulting in somewhat soft low-frequency sound. The ZEROs fixed that problem, allowing the SE9 to deliver powerful, clean bass. In addition, mid-frequency and treble clarity and detail were noticeably better. The two available solid state amps (one pair of nOrh Le Amp monoblocs, and a Marantz 2245) also generally benefitted from impedance multiplication . When using the ZEROs on 4X multiplication (16 ohms), the nOrh Le Amps delivered the best sound from the Reynauds of any combination I had heard. The easy power of the nOrh amps and 90dB efficiency of the Reynauds allowed plenty of headroom. However, compared to standard speaker cables (and 4 ohms), bass was cleaner and quicker, mid-range was significantly more open, and highs were sharper and better defined without added sibilance or other audible artifacts. Across the audible frequency range, detail seemed better, with improved imaging and soundstage. While imaging was still no match for the little Decware Zen Select, imaging was truly 3-dimensional allowing clear definition of instruments and vocals in space. Working with the ancient Marantz 2245 receiver had similar results - higher impedance speaker loads resulted in cleaner, more detailed sound. The Marantz never sounded so good! However, due to concerns about the design and age of the Marantz, I followed recommendations in the ZERO instructions and added a 3-amp, quick blow fuse in the circuit to protect the amplifier (in case of unwanted DC flow). With some speakers, results were more dramatic than with others. Although nOrh's SM6.9 speakers are listed as having a nominal impedance of 8 ohms, multiplying the impedance to 16 ohms produced cleaner, sharper bass and more coherent midrange than at a lower impedance. In fact, regardless of amplifier used, Dynaco ST70, nOrh Le Amps, or Marantz receiver, the SM6.9s worked best when used at higher impedance (these speakers demanded more power than any available single-ended amps could deliver). Using the 16 ohm amplifier output taps with ZERO 2x taps (16 ohms) allowed the ST70 to work superbly with the SM6.9s. The Autoformer with a DVD for scale. While the ZERO Autoformers were designed to act as impedance multipliers, they may also be used as impedance dividers by reversing direction of the leads. The Decware Zen SE84 series of amplifiers is known to have a somewhat perverse preference for low impedance loads. With some speakers, an 8-ohm impedance is almost too high, but 12 ohms is always too high. By reversing the leads and reducing speaker impedance to 4 ohms or less, the little Zen Select was able to drive most speakers more easily. Bass response becomes more pronounced and deeper, and mid-range sounds more full and musical. A side benefit of impedance reduction is the Zen delivers substantially more power at lower impedances than at high. Since it can only produce 1.8 wpc into 8 ohms, an increase in headroom is a welcome change. Every speaker tried with the Zen sounded better with the ZERO Autoformers, simply because of the peculiar requirement for low impedance. The Hornshoppe Horns not only could be played louder, but bass had more impact, more 'slam'. This improved the Horns ability to play orchestrated music with great dynamic range, and it improved the Zen's ability to play rock music loudly. The improvement in bass and dynamic range seems to have come with no downside - the famous Zen detail and imaging were not impaired by using the ZEROs. One standout combination was a pair of Omega TS2R loudspeakers, with the ZEROs at 1/3x. The nominal impedance should be about 2.7 ohms. With this combination, I sat and listened to disc after disc forgetting that I was supposed to be taking notes and reviewing equipment! The ZERO Autoformers are quite expensive for most people. In fact, the ZERO-Cable models with 8-foot leads used in this evaluation were more costly than most of the speakers and some of the amplifiers to which they were connected. On the other hand, the ZEROs are about mid-range in price for high-quality speaker cables - considering the ZEROs have a transformer and high quality speaker cable leads, the price doesn't seem quite so high. In addition, when a product works as well as the ZEROs, the high cost can be justified. The most important thing to remember about the ZERO Autoformers is: if there is no significant impedance mismatch, then there will be no real benefit to using the ZEROs. For example, when the Autoformers were connected as an impedance multiplier to a pair of B&W DM602 speakers there was little benefit for most tested amplifiers. In fact, the Le Amps and B&W combination sounded a little too bright with a strident sibilance that was distinctly irritating. The ZEROs will not win any beauty contests, except for dedicated audio enthusiasts and tweakers who love to have gizmos lying about - I think they look great, but the wife acceptance factor is a bit low. Of course, it is often possible to hide the ZEROs behind other equipment or furniture, if necessary. In order to have aesthetic acceptability for many people, the ZERO-Boxes would be required - which cost substantially more due to the hand labor involved in constructing them. Another option would be for an audio enthusiast to acquire the DIY-ZERO model and create boxes of their own. The ZERO Autoformers are a tweaker's delight. However, unlike some questionable audiophile accessories that are alleged to work through some inexplicable, metaphysical means, the ZEROs do work, they work very well, and their functionality can be demonstrated and explained through ordinary physics. In most speaker/amplifier combinations tried, the ZEROs demonstrated audible improvement. When used as an impedance multiplier, the observed result was generally improved bass control, better mid- and high-frequency detail, and an overall improvement in tonality. Using the ZEROs usually resulted in a livelier presentation. When used as an impedance divider, in the case of the Decware Zen SE84C Select, the ZEROs allowed deeper bass, richer, more lush sound, and greater available headroom. The ZERO Autoformer is a system modification that can result in subtle refinement or great improvement. It can be used to create synergy between mismatched amps and loudspeakers. The ZERO can be a delightful and useful tool in the tweaker's toolbox, but it isn't a universal fix for all systems. If your speakers and amplifier already have good synergy, then the ZEROs would be a very expensive experiment and might be a waste of money; if you have an impedance mismatch (even a small one), the ZERO Autoformers are well worth considering; or, if you have multiple components that don't often mix well, the ZEROs may very well be indispensable. My 'toolbox' already has a permanent place for them. Many thanks to Paul Speltz for providing information and the samples used in this evaluation. All photos by Richard George. Supplying the ZEROs Autoformers directly to music loving enthusiasts, like yourself, has been a lot of fun the past two years. Helping people get the most out of their systems is very rewarding for me. I will never get tired of hearing the reported improvements gained by using the ZEROs to optimally tune their speaker's impedance to the "sweet spot". One of the most difficult questions to answer is, "What will the ZEROs do for my system?". To help answer those questions, I simply provide everyone the same unedited feedback that I receive. From the ZEROs main web page, click on the picture of the guy jumping up in the air, labeled Field Reports. Hopefully, interested people can find amplifiers and/or speakers similar to theirs, which will help predict what the ZEROs might do for them. I originally set out to make an autoformer that would solve my overly bloomy bass issue which would, hopefully, not screw up the rest of the music. As you, I was a pleased to find that the autoformer provided sonic benefits from top to bottom thus bring more life to the music. It is easy to understand the benefits of raising the speaker's impedance for an OTL amplifier, but people have a harder time accepting the possible benefits of adding an autoformer in front of solid state amplifiers and tube amplifiers that already have multiple output taps. Your review of using the ZEROs with non-OTL amplifiers helps people get over that hurdle. Guys are even using the ZEROs behind their big Audio Research Tube amplifiers because "the 8 ohm tap sounds a lot better than the 4 ohm tap" and the ZEROs allow them to use the better sounding 8 ohm tap with their 4 ohm speakers. 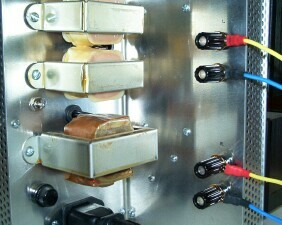 It is also fascinating to hear how solid state amplifiers tend to "clean up" their sound, when driving a lighter load. Using the ZEROs backwards seems to be an isolated benefit that only applies to the Decware Zen amps. I understand they are set up with a single 2 ohm output tap. I have a number of users running them this way on the Zen amps with similar reported results. The lower cost DIY-ZEROs ($433/pr delivered) are the most popular model. They are made of the identical autoformer and leads as the more expensive models. 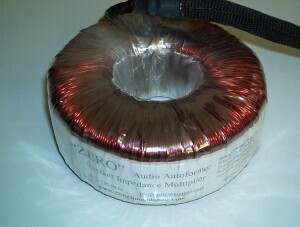 Visit: www.zeroimpedance.com to see how the DIY-ZEROs can be added to your existing speaker cables or how to easily dress them up. I am very glad the ZEROs worked out so well in your many different speaker / amplifier combinations. With the ZERO's on hand, you will no longer have to wonder if a particular speaker will work with your favorite amplifier, or if a particular amplifier works with your favorite speaker. I love how you were able to take a "terrible" amp/speaker combination, and with the addition of the ZEROs have it deliver a "beautiful, musically captivating performance".